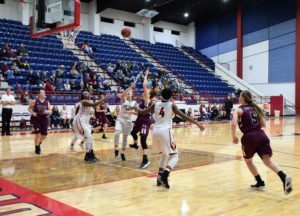 MADISONVILLE – Both the Lovelady Lady Lions and Centerville Lady Tigers qualified for the playoffs for the playoffs last week. 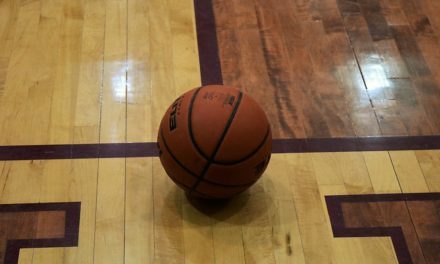 The two teams had tied for second place in District 20-2A, however, and as a result, the two squads squared off on a neutral court in Madisonville – Friday, Feb. 8 – to see which team would enter the playoffs as the second seed out of District 20-2A and who would be the third seed. 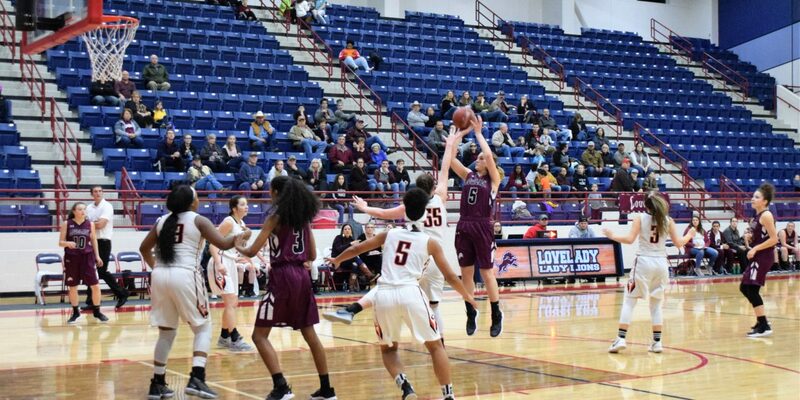 Skye Watts puts up a contested shot for two of her game-high 21 points as the Lovelady Lady Lions defeated the Centerville Lady Tigers by a score of 48-45. For the majority of the game, it appeared as if the Lady Tigers would enter the playoffs as the second seed. A stellar fourth quarter performance from the free throw line, however, allowed the Lady Lions to nip the Lady Tigers by a final score of 48-45. As the game got underway, the Lady Lions looked as if they were still emotionally drained from the 59-58 OT loss to the Grapeland Sandiettes earlier in the week. The Lady Tigers, on the other hand, seemed to out hustle Lovelady on every play and took an early 13-6 lead after the first eight minutes of play. Centerville’s points came from Averi Hancock with five, Brittany West with four and Kinsey Hardee, along with Nya West, who both had two. The Lady Lions points came from Kaiden LeMaire with a three-pointer, Skye Watts with two and Sarah Thompson with one. The second quarter saw Centerville spread the ball around as five Lady Tigers all scored two points apiece. The Lady Tigers who found the scoring column were: Hancock; Hardee; Hannah Matthews; Kaede Thomas; and N. West. Lovelady’s offense seemed to finally shake off the malaise of the first quarter to net 12 points in the second. Nine of the points came from LeMaire and the other five came from Watts. The Lady Lions, however, still found themselves trailing at the half by a score of 23-18. After the break, the two teams played evenly throughout the third quarter as both scored 10 points to make the score 33-28 – in favor of Centerville – with eight minutes remaining to play in the game. The Lady Tigers saw B. West drop in eight while Hancock accounted for the other two. Watts paced the Lady Lions with a pair of three pointers while Thompson and Baylee Granberry both had two. Down by five to start the final period of play, Lovelady began to chip away at the Centerville lead. The Lady Lions cut the lead to 34-30 with 6:36 left to play and with 3:24, Lovelady only trailed by one, 36-35. At the 2:50 mark, the Lady Lions took their first lead of the game at 37-36 and also found themselves in the bonus. 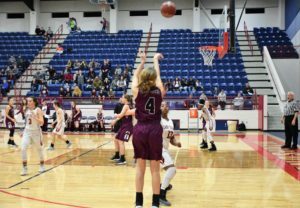 Baylee Granberry is pictured above as she knocks down a three-pointer to give the Lovelady Lady Lions their first lead of the night during fourth quarter action against the Centerville Lady Tigers. six. M. West had five on a three and a two-pointer. B. West had three on a shot from behind the arc, but she missed two from the line. Matthews also had three on a two but missed one of two from the charity stripe while Hardee only made one of two from the line to close out the Centerville fourth quarter point production. Meanwhile, Watts put on a clinic from the free throw line as she was 8-8 for Lovelady. LeMaire knocked down two, two-pointers to along with a pair of free throws, while Granberry added a three-pointer as well as going two-for-two from the charity stripe. Jala Rollo made one-of-two from the line, but it was enough as the Lady Lions completed the comeback to secure the second seed with a 48-45 win. On the game, Centerville was led in scoring by Brittany West with 15 points while both Averi Hancock and Nya West had nine apiece. Kinsey Hardee and Hannah Matthews both had five while Kaede Thomas added a pair of free throws to round out the Lady Tigers’ scoring. The Lady Lions were led by Skye Watts with a game-high 21 points and Kaiden LeMaire with 16. Baylee Granberry dropped in seven and Sarah Thompson had three. Jala Rollo chipped in one to account for the Lovelady point production. 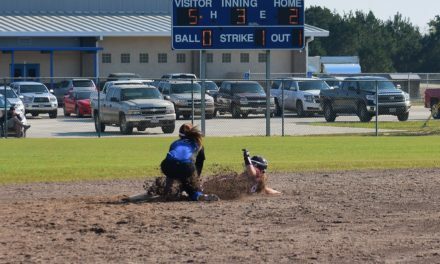 The win gave the second seed from District 20-2A to the Lady Lions who faced the Itasca Wampus Cats in the Bi-District round of the playoffs. The loss meant Centerville was the number three seed from District 20-2A. 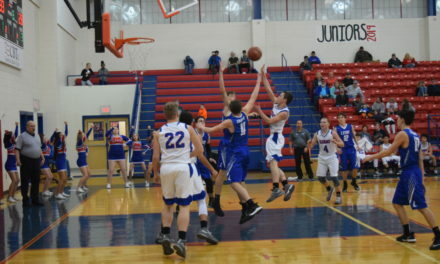 They faced the Cayuga Lady Wildcats in the first round of the playoffs. Unfortunately, the scores for both games were not available as of press time. Watts Signs with Paris Ju. Co.